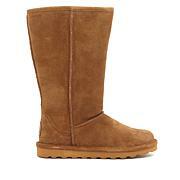 Bearpaw presents this gem of a bootie. With a ruched vamp and studded, buckled straps, the Amethyst exudes a moto-chic vibe. A sturdy block heel elevates the style, while a medial side zipper makes on and off a breeze. 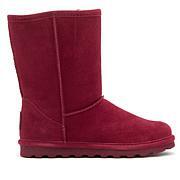 The color is a very rich wine suede. These boots are beautiful and very high quality. Dont hesitate to order. Fit is true to size. 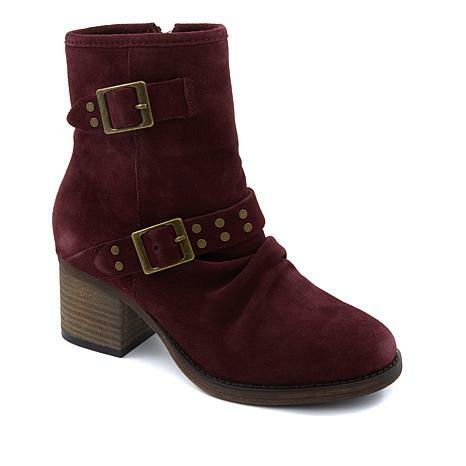 These boots are beautiful- the most plush, luxurious suede ever. 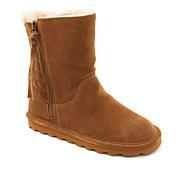 The fit is perfect and the height of the boot is very comfortable on. Wear dressed up or with leggings. I got the wine and loved them so much I went back for the charcoal. Fabulous booties. Stylish, on trend and the Never Wet feature is brilliant! Thank you, HSN, for always providing your customers with great products. I LOVE these booties!!! The fit is true to size ,perfect, and they are so comfortable. I can wear them all day, and I forget to take them off when I get home from work!! Wish they came in more colors!! Got these in the mail today and they are JUST as advertised. The wine is so saturated. The suede feels so lux and has some give. I cant believe that I don't have to worry about staining with these. Very high fashion. The inner lining is SOooo soft. I hate socks, so I'm always looking for shoes and boots that allow my feet to breath but are still warm. It looks heavy, but is light. Please bring this back in other colors. Would love to see this in sand, olive, expresso and navy.